Hollis Brookline senior Nick Fothergill tries to spin past Lebanon’s Ryan Milliken on March 15 during HB’s semifinal loss. DURHAM – The ball was bouncing around at half court and belonged to anyone. Yes, a 50-50 ball. 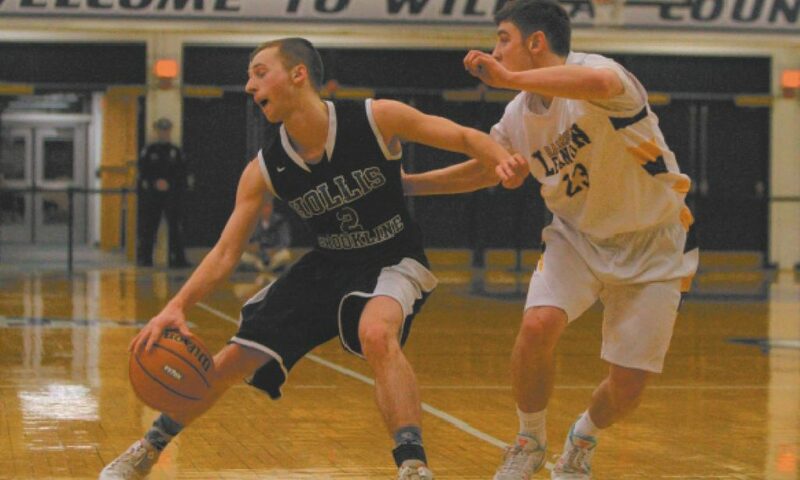 That was the story of the Cavaliers’ night, as Milliken was sparkplug for No. 1 Lebanon in a 50-36 Division II semifinal boys basketball win March 15 over HB at the University of New Hampshire’s Lundholm Gym. The No. 4 Cavaliers, done at 15-6, just couldn’t climb high enough as they never had the lead. The Raiders (20-1) rolled past Coe-Brown for the title on Saturday. The Cavaliers had grit, but the Raiders had speed. And Milliken, who finished with 21 points, but Hollis Brookline had a lot of Matt Simco, who led them with 20 points and set a tough inside tone. But that toughness worked against the Cavaliers at a critical juncture. With HB down 42-34 with 2:59 to play, there was contact after the whistle and a technical was called on Giaconia, who was battling a sinus infection all week. The Raiders’ K.J. Matte hit two of three free throws, and 40 seconds later, Milliken hit a pair and Lebanon was off on a game clinching 8-2 run. Thanks in part to Simco. One thing that hurt the Cavs was they were outrebounded, 26-22, and that was supposed to be their bread and butter. The Cavs were behind from the get-go, down 8-2. They closed to 13-11 early in the second quarter, but a 16-6 Raider run to end the half, keyed by a couple of Matt Eylander put-backs, had the top seed up 29-17. But to the Cavs’ credit, the Raiders weren’t able to run away and hide, even though it looked at times as if they would. They had cut the Raider lead to 39-32 with 5:41 to play and had the ball, but the Raiders’ Graham Chickering stole the ball, Milliken raced in for a layup and HB never got any closer. True, the Cavaliers had 15 turnovers to the Raiders’ 10. But Lebanon’s real advantage was its speed, the tempo set by Milliken, Divison II’s Player of the Year. The Raiders should also get credit for holding the rest of HB’s scorers at bay. Nick Fothergill came after Simco with seven points. But they also did a good job on the other Raiders, as Graham Chickering was next after Milliken with nine. And, unfortunately for the Cavs, they weren’t able to.